We are proud to introduce our participation in Davidson's Inc's "Gallery of Guns". With offerings from the firearms industry's premier manufacturers, and a vast inventory of firearms, we are confident you will find the firearm you are looking for. Ordering is simple... simply search for and select your firearm, pay a small deposit, and your order will ship to our retail location were we will assist in completing your purchase. Best of all, most orders arrive within 2 business days, and there are no transfer fees! * Before you consider purchasing any firearm, be sure that you are in compliance with all federal, state and local laws governing the purchase, ownership and use of firearms. 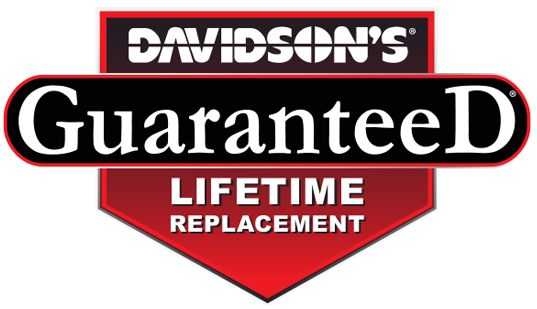 ** All Davidson's Inc firearms include the GuaranteeD Lifetime Replacement Warranty, which backs all of the firearms Davidson's sells. If you ever experience a defect with a firearm purchased through Davidson's, a Brand New Replacement* will be provided. Should your two-year old bolt-action rifle break a firing pin a week before the annual "boys outing" the first day of deer season, “we've got you covered.” Imagine a new firearm right out of the box!! If it is defective, it is covered, period. For full Terms and Conditions, or to file a claim, click on the logo below.